At the beginning of the day, this was 24 various hockey jerseys and 2 yards of a solid green cotton. Five and a half hours later, these bits have become a quilt top, ready for batting and backing and quilting. There's a corner of the backing on the left - digital camouflage fabric. I'm thrilled to get these jerseys off the design wall - er, floor - and up onto the basting table! Both baby quilts are complete. One has a nice little traditional backing. The other has a funky pieced backing. That's the one Cathy chose for her new grandson-to-be. The other one is soon on its way to Japan. I buy fabrics when they are on sale. And somehow, not by design, I accumulated several fabrics with stars. Over the years I've used these fabrics and yet still have had some left. One of these starry projects was a baby quilt for Bradley Smejkal back in 2008. 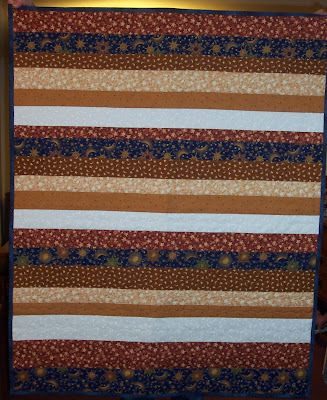 Another baby quilt was done as a scrap quilt to demonstrate reversible quilting. Angela McMahon and her new little baby girl received this quilt last November - see my blog entry about this quilt. Bradley Smejkal is having a baby brother this spring. And since I made baby quilts for both him and his sister, of course I have to make one for this new little guy. And as I was starting work on this quilt, I knew I had to do a charity quilt to go to Japan. Here is one completed quilt. Its backing is mostly one fabric. The backing for the second quilt is also here, even though I'm still piecing its top. I ran out of the darker blue with stars on it and had to substitute a plain blue on the front. And for the back? Determined to not have any more starry scraps, I used as much as I could for the back. 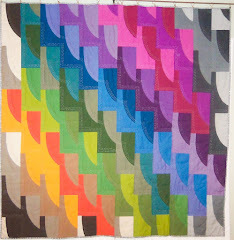 I would have never done something like this before my involvement with the Chicago Modern Quilt Guild - I love the effect this group is having on me! I need to do another baby quilt, and I know it's for a little girl. But before I decide on fabrics and design, I will get busy on the hockey/sports jersey quilts that are on the studio design wall - er, floor - and finish the second starry baby quilt. I know how lucky I am - I have a HUGE studio. But sometimes it's just not big enough. In the upper left corner is my red scrap quilt - it has to stay where it is because I'm auditioning different fabrics for sashing and border and still thinking about design and I just need to see it. In the middle is one of the hockey jersey quilts, the layout of which was designed by the mom. It has to stay there until I can at least connect the shirts into rows - the good news is that I have the fabric. The second pile of uncut jerseys - I need to trim them and then do the layout. Two of the rows are going to be taller than the rest, and one row will only have 3 shirts because the design is so wide. So that needs to stay as it is until I can trim them. Finally - one of the baby quilts. Each row has been made. But now I need to press and then sew the rows together. I could pick up this quilt - except I like looking at it. Tonight I'm meeting a college roommate from Saint Louis in Springfield for a visit and an overnight. Tomorrow afternoon (let's hear it for the NCAA games!) I'll get back to one of these. Probably the jersey quilt in the middle. Or the baby quilt.. Despite the hockey jerseys being ready to go, I've got a couple of baby quilts I have to get out of my system. The baby quilt blocks we did at the Chicago Modern Quilt Guild retreat were so quick and energizing that I've decided to do the same pattern. Here are the four fabrics cut into 2.5" strips. After some intense strip sewing and ironing, here's the effect I'm going for on the finished projects. One of these is going to my friend Cathy's fifth grandchild, who has another few months of incubating to go. The second quilt will be a charity quilt that will go to Japan. Interested? Here's the link through the equilter website. Thank you, blogger friend Carol G, for planting this idea! The quilt for Cathy's 4th grandchild incorporated some of these same fabrics! My studio has taken on a different aura. Can you smell it? It's the smell of teenage boys and gyms. I'd say the smell is like that of a hockey rink, but seriously - I've never been in one. This is going to be a high school graduation present. In addition to hockey, this young man is also involved in hunting, and his mother has requested camouflage fabric for the back of the quilt. The fabric is ordered but hasn't yet arrived. Once it does arrive, I'll make a decision on what fabric to use for the sashing. Hard to believe these jerseys will turn into a fabulous quilt. But they will! So often my quilts are planned out. It starts with the design and then the fabrics. How much of each fabric will I need, what size will be the blocks be, what will the borders be, will it be a hanger or a dragger, etc. Here's what I did on the quilting retreat with my red scraps. I was intending these bits to be a row in a scrap quilt. What I'm discovering is that what I have is a lot like a paragraph or an essay without punctuation. Instead of words running together, here all the reds just get lost in this huge maze.But when I separate the blocks, the effect is more pleasant to my eye. Instead of being a row of reds in a scrap quilt, I think these may become a wall hanging. Perhaps black will be good for the sashing. I think I need to leave these blocks on my design floor and just study them over the next few days while I begin one of the graduation hockey jersey quilt for May/June. Some of my deadline are client-driven. But many of them are self-imposed. This Jinny Beyer table runner was something I wanted to have finished by Wednesday, but life intervened when my mom was hospitalized for two days. So now, thanks to the onset of a cold and skipping a workout, this table runner is now on our dining room table and I can move on to the red scrap project I started at the Chicago Modern Quilt Guild retreat. And the new purse kit that just came. And the Drunkard's Path I started at the retreat. And the pile of batiks that are just begging to be used. And - well, you get the idea. And if it's March, that means June graduations are not far behind. There are 3 t-shirt/jersey quilts in the works which have real deadlines. The final deadline for Christopher - his quilt from Bradley's shirts - has been met, and he's coming over tomorrow to pick it up. I'll be sad to say goodbye to Chris - he's been great to work for. He's a great guy who has been instrumental in helping himself and his family grieve Bradley's death. "It was the best of times. It was the worst of times..." A Tale of Two Cities was a favorite of mine to teach, especially the opening (and of course the closing) lines. Our lives are made of good times and bad times, often happening at the same time. My grandson Ryan is currently reading this book in his sophomore English class, and I hope his teacher is making this book come alive. Each character illustrates so vividly how our actions matter, even and especially after death. Christopher's Grief Quilt from his brother Bradley's shirts is finished. And this has definitely been for him and his family the worst of times. I didn't know Bradley or any of the LeGrand family. But through Chris I have met them, learned about them, and have felt their pain over the loss of Bradley. I wonder if Bradley had any idea of how he might be missed - I wonder if any of us realizes the impact our lives have on others. Sometimes it takes a movie like A Wonderful Life or a book like A Tale of Two Cities to lead us to this realization. For others it takes a death like Bradley's for us to know how fragile our lives are. Chris and his family will mourn Bradley forever as they also celebrate his life. To balance the sadness in my studio when I'm working on grief projects, I like to do baby quilts. And one fell into my lap at the recent Chicago Modern Guild Quilt Retreat. The 15 of us strip-pieced 2.5" strips and within 30 minutes we had the blocks for 3 baby quilts made. I volunteered to assemble and quilt one of these quilts for Project Linus. As I worked on this quilt I couldn't help but think about the sick child and parent it will go to and the small security it will give. I thought about how blessed my life has been and how much support I have to meet my life's challenges. I'm also starting two baby quilt this week for my friend Cathy's fifth grandchild and friend Cecilia's third grandchild. For their families, it is the best of times. Today was a limited sewing day. After working on Christopher's quilt for an hour, I switiched over to Paula's project - it's small, it's fabulous, and it's finished. She made us a beautiful photo album of our trip to Kenya, and I think this hanging is a fair trade! Now I can give my undivided attention to Christopher and have his quilt finished by Saturday. 23" x 31"
This is one of my favorite parts of the quilt process. All layers are basted together, and the quilting has begun. With basting I work from the middle towards the edges. But when sewing I start with the outer edges and work my way in, taking out the straight pins as I go. There are still a lot of pins in Christopher's quilt, but I've taken out almost 150 so far. With every row of stitches I can see this quilt taking its shape and its final form. By Sunday it ought to be perfect. 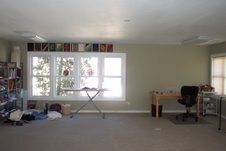 Note about quilting: my work space is L-shaped and big. It's perfect for supporting this quilt as I work my way around and around it. In lieu of a side table, an ironing board can be used to provide support for the quilt - and the quilter! All three layers of Christopher's quilt are ready to put together. The top has its borders. The batting has been breathing now for several days, and the backing has been seamed together and has the words on it. And John is always the best sport about helping me assemble these three layers and transfer them to the work tables. This quilt will 70" x 90". I went to my first one ever and had the best time. 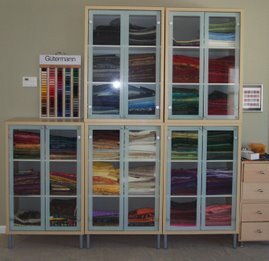 15 of us from the Chicago Modern Quilt Guild were at the Siena Center in Racine, WI. One highlight of the weekend was just seeing how others work and what they were working on. Another was getting to see and use a fabric die cutter, thanks to Ebony Love. Best of all was getting to know the women in this group. The CMQG is fairly new, and this was its first retreat. It went so well that there is already the planning in the works for one in November and one in March 2012! 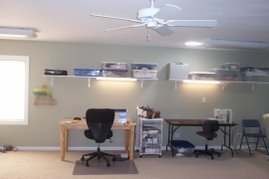 I worked on three projects and found my biggest challenge was space. Although I took a big box of scraps, I only worked with my reds. My stopping point was a space issue - I need now to border these pieces to a uniform size and then go through the same process with other colors of scraps. I'm thinking this will be the row of a quilt. Paula's t-shirt wall hanging was another project I had with me. It's all assembled and now ready for the outer borders, which is part of a quilt-as-you-go process. And these borders have to be centered and mitered. So again, I reached a lack-of-space stumbling block and will finish it in my studio. Because I knew Ebony was bringing her AccuQuilt Die Cutter, I grabbed two batiks at the last minute and used them for Drunkard's Path pieces. I cut as many 12" squares from the two fabrics and ran them through the die cutter. Within 10 minutes I had all my pieces. Notice the notches! I'm so impressed with this machine. The rest of my retreat time was spent piecing these squares. At some point I'll figure out exactly how many blocks I have and plot my layout on my Electric Quilt software. Saturday after dinner CMQG President Beth divided us into three teams of 5, gave each team the same number of 2.5" strips, and told each team to make Fence Rail blocks. My team did it in 22 minutes! Each team's blocks are making a baby quilt like this. I pieced this one together and will quilt/bind it for Project Linus. Two other guild members are finishing the other ones. I can't wait for the next retreat. But meanwhile today I'm working on Christopher's Bradley Quilt. This quilt is my priority for the week! Check out fellow retreater/blogger Karen's post for more details about our terrific weekend. Look! Two of our favorites - grandchildren and travelling - in the same picture! We had such a terrific time in Kenya, and this wall hanging from two t-shirts, the flag of Kenya, and two great ethnic prints will always remind us of our Kenyan safari with my sister Paula and her husband Dennis. It hangs above our entertainment center, which serves as an everchanging display for the latest pictures of the grandkids and the latest travel souvenirs. 22" x 47"
Tomorrow begins a 3-day retreat with the Chicago Modern Quilt Guild. 15 of us are heading to Racine, Wisconsin; and I'm pretty excited about going. Since I have a studio and sew all the time, this retreat presents a special opportunity for me to do something out of my comfort zone. So far I know I'm packing my scraps and the "ingredients" for Paula's Kenya wall hanging. Stay tuned for what actually emerges from this weekend! 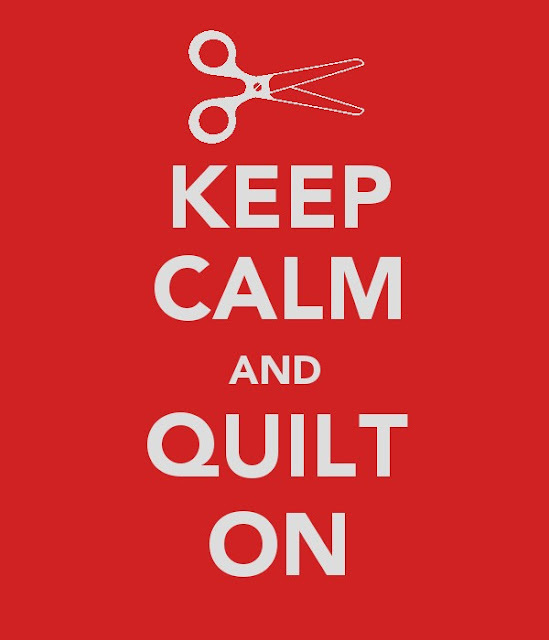 However, John made one of his rare quilting requests. He asked that I begin work on the wall hanging of the two Kenya t-shirts and Kenyan flag. So I got busy on that. And it turned out to be exactly what I wanted to do. I might have even gotten this quilted and bound except Midge, my direction reader, had some time to work on the hobo bags we started, the same one I'm stuck on. So we spent a couple of hours finishing them. I need to carry this for a couple of day before I figure out where and if I want a snap closure and whether the handle/strap needs any adjustment. The one thing I know about this purse is that I again have loved using Soft and Stable by byannie.com as the purse lining. This evening I'll continue work binding one of Ebony's quilts, something I happily volunteered to do in exchange for the work she did on Cristina's quilt. Some days don't have enough hours in them. Today is one of those days. And in the back of my mind all day has been what I want to work on this weekend at the Chicago Modern Quilt Guild retreat in Racine. I still don't know - what a lovely "problem" to have!